Understanding and limiting electromigration in thin films is essential to the continued development of advanced copper interconnects for integrated circuits. Electromigration in thin films and electronic devices provides an up-to-date review of key topics in this commercially important area. Part one consists of three introductory chapters, covering modelling of electromigration phenomena, modelling electromigration using the peridynamics approach and simulation and x-ray microbeam studies of electromigration. Part two deals with electromigration issues in copper interconnects, including x-ray microbeam analysis, voiding, microstructural evolution and electromigration failure. Finally, part three covers electromigration in solder, with chapters discussing topics such as electromigration-induced microstructural evolution and electromigration in flip-chip solder joints. 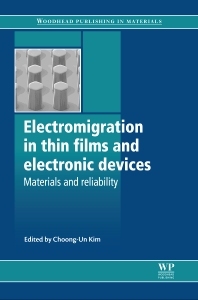 With its distinguished editor and international team of contributors, Electromigration in thin films and electronic devices is an essential reference for materials scientists and engineers in the microelectronics, packaging and interconnects industries, as well as all those with an academic research interest in the field. Materials scientists and engineers in the microelectronics, packaging and interconnects industries, as well as all those with an academic research interest in the field. Choong-Un Kim is Professor of Materials Science and Engineering at the University of Texas at Arlington, USA.